Vadakara which lies in the northern part of Kerala is one among the 20 Lok Sabha constituencies. The town that lies in the coastal town of Kozhikode district is also the headquarters of Vadakara taluka. Vadakara's constituency number is 3. Vadakara Lok Sabha constituency comprises of seven assembly segments including Thalassery, Kuthuparamba, Vatakara, Kuttiadi, Nadapuram, Quilandy and Perambra. 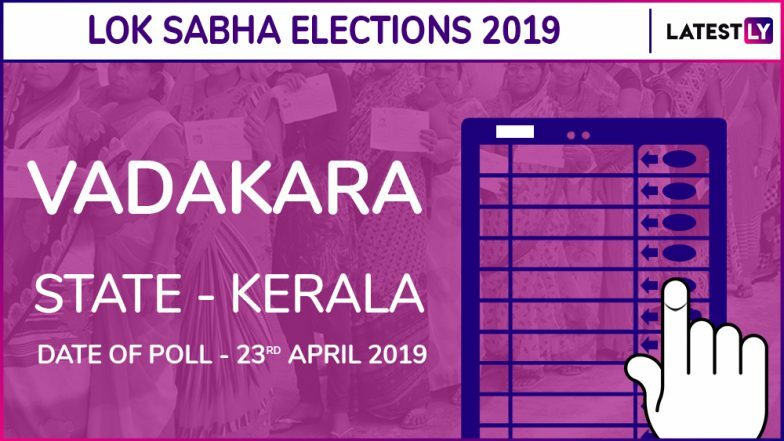 Kerala will vote in the Lok Sabha Elections 2019 in the third phase on April 23. In Vadakara, Congress' strongman K Muraleedharan will take on LDF candidate EP Jayarajan who is CPI(M)'s Kannur district secretary. Muraleedharan is the sitting MLA from the Vattiyoorkav constituency in Thiruvananthapuram. Although he is accused of two political murders, the party says it is a politically-motivated case. The party High Command opted Muraleedharan, as KPCC President and sitting MP of Vadakara Mullappally Ramachandran did not want to contest this election. Meanwhile, BJP re-nominated party State secretary V K Sajeevan to contest from Vadakara. Check Full Schedule of Lok Sabha Elections 2019. In 2014, the Congress won in Vadakara with 43.41% of the vote while the CPI(M) garnered 43.07%. Congress MP Mullappally Ramachandran has won the Vadakara Lok Sabha constituency twice in a row. He had defeated the CPI(M)'s AN Shamseer by a narrow margin of slightly more than 3,000 votes. Ramachandran is currently the sitting MLA and Congress is hoping to cash on his works to return to power. In Vadakara, the main political tussle will be between the Left Democratic Front (LDF) and the United Democratic Front (UDF) with BJP being the other major party. The Lok Sabha elections 2019 will be held in India in seven phases between April 11 and May 19. The voting is scheduled to happen in seven phases across the country. Kerala will vote in a single phase on April 23. Voting will be held for 115 Lok Sabha constituencies in 14 states in the third phase. The counting of votes will be held and results will be declared on May 23.